Local artist Armando Gabrera was joined by his mother, Rose at the Monterey Park’s Historical Society Open House held at Garvey Ranch Park on December 13. 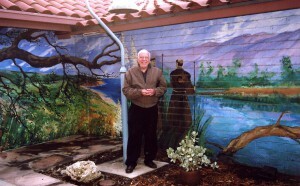 He was honored for painting the mural “Primeval” in the Mission Room. He also painted the outdoor mural on the side of the building. 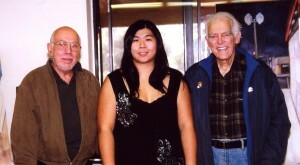 Armando Cabrera, Wing-Yee Lee and Douglas Alkire presented some of their artwork for the guests to enjoy. Mr. Gabrera said he grew up in Montebello and was exposed to the great outdoors when he was a Boy Scout. He wandered the Montebello hills and explored other areas in the San Gabriel Valley. The art project of the murals fit into his life. He tied the area together as one soul. He created the murals based on his love of nature. You can sense the runoff of the water from the mountains and the chaparral. 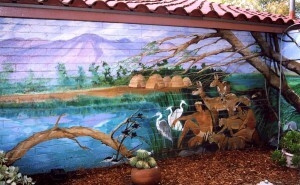 He created the murals using his love of nature and the experience of the Tongva Indians who roamed throughout the area. He sketched his scene first on paper and later sketched them on the wall. He painted the murals using special acrylic paints. He uses NOVA colors for his outside murals. 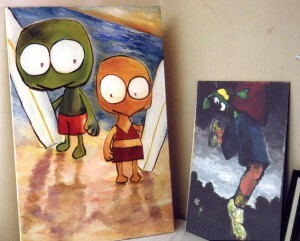 Mr. Alkire said he was introduced to painting by a co-worker. He paints his pictures to preserve desert scenes so he can enjoy them at home. He met great artists that included Clyde Forsytha, Sam Hyde Harris, Jimmy Swinnerton and Norman Rockwell at an Art Colony in Alhambra. He asked each artist about his various art techniques. He was working on improving his own. Mr. Rockwell, who called himself an illustrator, used sable brushes and painted from photographs. Mr. Alkire said his painting technique was much like Norman Rockwell. 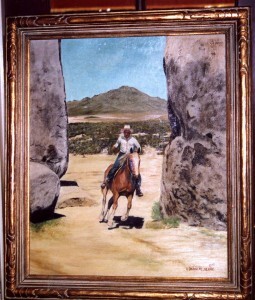 Mr. Alkire donated this cowboy picture to the museum. 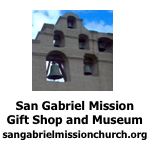 The Historical Society Museum located at Garvey Ranch Park is opened free to the public on Saturdays and Sundays from 2 to 4 PM.